I saw Africa, Offline: Waiting for the Web in today’s edition of The New York Times, which states that less than 4% of Africa’s population is connected to the web, and that most of these are in South Africa and some of the northern Africa countries. It seems that while most of the world is trying to put together elearning solutions and various non-profit organisations blog and work from Africa, the fact that most of the continent is not connected seems to have missed them. There are quite a few initiatives on the go and I have been fortunate enough to have been involved in a number of elearning initiatives. However with the cost of connectivity running at about over 50% of the per capita income of the people we are trying to reach, it is the telecoms that are killing the programs. So all the good intentions in the world of getting rural teachers, nurses and clinic staff educated via elearning, are not helping if the infrastructure is costing more than a teacher’s annual salary. Ok – rant over. Read the article. When the big names start getting into widget fundraising and personal events we are starting to look at a massive movement towards decentralizing the organizational website. Instead of having a single ‘official’ landing page, Convio is driving the trend towards having hundreds of smaller widgets – a kind of the best people to raise money/awareness are your donors, so lets give them the tools to do it philosophy. I predict that this type of decentralization is going to be the trend that drives fundraising and philanthropy into the next stage. By seeing each constituent as a node in a network rather than a part of an organization, group fundraising helps you tap the knowledge, enthusiasm, and the peer network of people already giving to your cause. Its the wisdom of individuals in a crowd, applied to outreach. It is an elearning week. I’ve been poking around microformats for the last while. Although there has been a lot of adoption of microformats, they haven’t really gone mainstream. Yet. Given the rate of adoption though, and the fact that a mainstream’ish site like LinkedIn boasts over 9 million hResume based profiles, my feeling is that its only a matter of time. So what are they? Basically its a way of representing information in such a way that a parser, be it a browser or a bot, can read the information and recognize it as a business card or a resume. It could be a way for recruitment sites to standardize information so that you don’t have to retype your resume every time you hit a new job site. So yes, its a standard if you want to look at it that way, but what makes it different from something like the vcard standard is that it is implemented in html which means that browsers that don’t support the standard can still read the information. Since it is implemented in html, it also means that designers can use css to style the elements in whichever way they please without effecting the standard. Pretty simple and elegant solution all around actually. Each element is encased in a div tag with specific class, the parser looks for elements that have a specific class name and parses their contents. Nice! Here is my hCard as an example. My only concern with the format is that the person’s email address is left open to spam if published this way – hence my fiendishly clever use of the demo@ address. Hi – please vote for my manifesto on changethis.com. Its pretty much a guide on how to use crowds to help you raise funds online. In a recent BBC story, Beating congestion with mobiles, they describe a pretty cool experiment in collecting real-time traffic information. 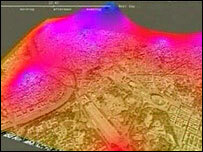 MIT’s Real Time Rome aggregates data from mobile phones, buses and taxis in Rome to model traffic in real time. They’re using Telcom Italia’s LocHNESs system to collect mobile phone information. There are obvious questions as to who owns the data and whether permission is required in order to collect that data, but on masse I don’t suspect that this should be a problem. The possibilities are really impressive though, sending buses to where people are, knowing where traffic congestions are about to occur, through in some AI and we could be looking at a predictive system which could optimize traffic routes and lights. There is also a short article on this in the March 2007 Economist Technology Quarterly. Very interesting and very cool. Now where else do we have masses of free data just waiting to be put to a good use?